Awesome post! 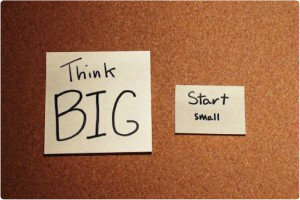 I love how you brought into it breaking down your big goal into smaller ones! Thats a huge part of what I do on a day to day basis in the gym. Getting one more rep with a certain amount of weight, having one more set, or running for one more minute can make all the difference in the long run. I don’t know about you but I don’t EVER want to look back on my life and think about the times where I could have done more! Thank you! It feels awesome to accomplish a big goal huh?? Good luck on your half and eventual full marathons, I know with your attitude you will be there in no time! This is GREAT advice and something that I’m already doing on my weight loss journey! Instead of focusing on the big, end-all-be-all number I need to lose, I have smaller goals that I devote my energy to on the day-to-day. Eventually a “healthy” weight will show up on the scale, but right now I’m more focused on the little victories than that big prize at the end. Thanks Rachael! Keep up the great work, the longer you go focusing on those daily goals the more and more momentum you will create! That was a good read.. Thanks!! Thanks Gautham, glad you enjoyed it. Great post!! I needed to hear this today!! Thank you!! Thanks, I hope it helped or inspired you on your journey to accomplish your big goal! It really did!! Thank you!! Matt, great post. I love your point about setting BIG goals, but then focusing on the little steps that will ultimately get you to your BIG goal. Great advice for all of us. Thanks Travis! Glad you enjoyed it! Wow! What a great post – would you mind if I reblogged this? – it’s fantastic! It is SO important to break bigger goals into smaller manageable steps and people forget this along the way! I’m currently training for a half ironman (maybe one day a full) so the smaller goals along the way definitely keep me focused and on track! Thank you and yes of course you can reblog it, I appreciate it! Good luck on your ironman training, that is some insane stuff, I’ll be following! Fantastic piece! Your advice is spot on too. Small daily deposits into your performance account allows you to reach those big goals. Love your attitude and inspiration. Wise words Matt! Thank you for following my blog, most appreciated. And on a plus side, I also play Golf as hopefully one day, a professional sport. Thank you for your support. God Bless and good luck with your Golf as well. Wow- what a pleasure to read ! I really like both your posts and your site layout. Yes, dreams are what life is all about. Without them we would never accomplish much other than the mundane drudgery of mere existence. You have a great blog! How cool to work towards your dream and share the journey with us. Thanks! hey man thanks for looking at my blog. you’re definitely established blogger compared to me! Funny, your example of push-up reminded me that I have yet to do my 100-a-day push up KPI. Time to get it done. I like the way you have approached the underlying theme of this post. I agree with everything that has been mentioned in it. I would also like to say that Goal is a dynamic thing, once you achieve something successfully, then that is the tricky moment where one has to cherish the moment of success and move ahead to the next objective. One must not over-live the moment of success. This skill differentiates ordinary and extraordinary This is how life goes, this approach makes us feel alive. Never in my wildest dreams did I ever think that I would have a blog, let alone one that I actually kept track of and was passionate about. That said, it is making my dreams come true and my journey a hundred times more exciting and colourful. Since starting to write this I have noticed how much more positive I have become in my outlook on life and how I’m trying more and more to share that energy with others. It’s making my personal life better, it’s making my job better; win, win! On my journey so far I have encountered some people (virtually and in real life) who have changed me or shaped me, changed my direction or inspired me and I just wanted to throw a huge thanks to them all (and all y’all for reading). I came across the post I’m reblogging about a week or two ago from this fantastic gentleman who wrote about dreams. The post really struck a chord with me and I asked if he would mind if I shared it on; his passion is clear in his writing and I definitely feel like it spoke to me. It really helped me maintain my focus and get my mojo back for this HIM prep! Moving on to today; I’d been making more of an effort to tweet about my workouts etc and this other fab blogger got in touch! A “new to triathlon” blogger who, get this, has signed up for a 140.6 FULL distance Ironman this year! How AWESOME is that!!?! (I don’t mean any disrespect with my quotation marks – I feel like that piece of information needed to be included in there!). Anyway, another person who has totally inspired me and made me think WOW! I would never have come across these people (just 2 examples) if I hadn’t started on this journey or begun writing this blog. What is my main point here? Get out of your comfort zone, do something you thought you could never do. Sign up for that be all and end all race that you just didn’t think would be possible. Start writing that blog, or running that business – whatever it is that makes you tick! And then… enjoy the journey, look out for the gems along the way and the treasures of meeting these people who will enhance your adventure and give you gifts of insight, advice, experience or maybe just a funny anecdote. Whatever it is, it contributes and makes it better for you! Just remember to enjoy it! I’m sorry for the lack of updates, I’m still here and I’ll update soon. I’ve been focusing a lot of my energy over the past several months toward another project I’m working on. Unfortunately, schedules and other factors have made it difficult to get in many rounds of golf since November, but I’ll get back into the swing of things here in the next few weeks and have an update shortly. It certainly is…thank you for your interest and continued support Kurt! This is great advice that will benefit many people. Thank you for sharing.